We’d love your help. Let us know what’s wrong with this preview of Mystery of the Egyptian Scroll by Scott Peters. ZET TRIES TO TRACK DOWN A MISSING SCROLL IN HIS FIRST EXCITING ADVENTURE. 12-year-old Zet and his sister Kat are in charge of the family pottery stall now that their father is off fight You, who have dug deep and sifted hard for a story to read, have unearthed an ancient treasure: a mystery from the dusty ages, when a boy could be a hero and fight for the good of all . . .
12-year-old Zet and his sister Kat are in charge of the family pottery stall now that their father is off fighting the Hyksos. Who knew putting food on the table could be so hard? When he hears a thief has stolen an important scroll--and that there's a reward for the thief's capture--he's determined to win it. To ask other readers questions about Mystery of the Egyptian Scroll, please sign up. Mystery of the Egyptian Scroll is by Scott Peters. It is the first book in a new series of Zet’s mystery cases. Zet and Kat spend their days in the market in their booth. They try to sell clay pots. Business has fallen off since Father had been arrested and the children had taken over the booth. Mother is recuperating from childbirth. It is all up to Zet and Kat. They get involved in a case where someone has something someone else wants and it could mean problems for the Pharaoh. The two childr Mystery of the Egyptian Scroll is by Scott Peters. It is the first book in a new series of Zet’s mystery cases. Zet and Kat spend their days in the market in their booth. They try to sell clay pots. Business has fallen off since Father had been arrested and the children had taken over the booth. Mother is recuperating from childbirth. It is all up to Zet and Kat. They get involved in a case where someone has something someone else wants and it could mean problems for the Pharaoh. The two children get involved this case. The book was well written and deals with Egypt which is a hot topic these days. It is a youth book rather than an adult book. I believe students will bond with Zet and Kat against the world. Setting the book in Thebes and bringing in a touch of Egyptian mythology makes the story believable and yet unbelievable at the same time. Several different lessons are taught in a fun manner. Taking care of one’s family is one theme that is worked throughout by Zet. Caring for others, honesty, and living up to your promises are just a few of the themes touched on. I really like the four questions the author was asked just combine with the story to make the entire process meaningful and fun. I was a bit put off by the title of the series, bu Homeschoolers, add this gem to your stack of Ancient Civ historical fiction. The characters are endearing and the plot keeps the reader engaged. Provides opportunity to discuss responsibility to both family and country while learning about the Egyptian city of Thebes. I was a bit put off by the title of the series, but think the book is a good fit for grades 3-8. The setting and the characters are fun, and the two children are virtuous and endearing; their hearts in the right place. The author, as he has pointed out, has taken time to ensure the historical accuracy of the story. It's a short story, and written at a grade level that kids can understand. By focusing on the intrigue and the mystery, plus some action, the story is accessible to kids, rather than engulf young readers with minutiae of history and culture. My slight hesitancy comes from the imp The setting and the characters are fun, and the two children are virtuous and endearing; their hearts in the right place. The author, as he has pointed out, has taken time to ensure the historical accuracy of the story. My slight hesitancy comes from the improbability of the story, and how the kids would by luck get the emerging details of a plot against royalty. But that's par for the course for kids' stories, putting them in the same league as adults as to success and manoeuvrability. In “The Mystery of the Egyptian Scroll,” Scott Peters has provided the reader with a fast, paced mystery set in the times of ancient Thebes in Egypt. The book is probably written for the middle school to early high school reading levels. As a former teacher, I am always interested in books that may get children reading, and this is one! Serving in the Pharaoh’s army, father has gone to war to fight the Hyksos, and times are hard for the family left behind. Eleven-year-old Zet and his younger sist In “The Mystery of the Egyptian Scroll,” Scott Peters has provided the reader with a fast, paced mystery set in the times of ancient Thebes in Egypt. The book is probably written for the middle school to early high school reading levels. As a former teacher, I am always interested in books that may get children reading, and this is one! Serving in the Pharaoh’s army, father has gone to war to fight the Hyksos, and times are hard for the family left behind. Eleven-year-old Zet and his younger sister Kat are left with the responsibility of minding the shop, but each week the children’s earnings dwindle until they fear they won’t have enough to feed themselves, their baby brother and their mother. So when a thief bounds through the market place, Zet overhears a medjay (police officer) offer a reward for information. So he steps up to the medjay to offer to help catch the thief in exchange for the reward. Of course Kat, his younger sister, thinks he's crazy. Unfortunately, this foolhearty decision soon lands Zet and his sister in dangerous trouble, so deep their very lives and the lives of their family as well as others are in extreme danger. The book is well written with strong description of the characters and the events. Peters depicts a realistic Egyptian setting for this historical novel. Without question, it is an action-packed mystery set in an ancient land with great attention to detail; the book will appeal to young and old readers alike. There are several simple themes running through the book; the most obvious are: Don’t judge a book by its cover, and The importance of doing what is right – both for your family and your fellow man. Since things are not what they appear to be, to save their family, Zet and Kat together must learn about people: who to trust and who has evil motives. If you are interested in a quick read for yourself or in introducing a delightful mystery for a younger person, I do recommend this historical novel, “The Mystery of the Egyptian Scroll” by Scott Peters, to all middle grade readers or adults who may enjoy a quick, historical mystery. This book offers better than average characters and a decent, reasonably well plotted and well paced mystery/adventure, but where it truly excels is in its ancient Egyptian setting. This book nails time and place. We have a pre-Christian time and fabulous and romantic New Kingdom Egypt. Scott Peters has written other works for kids that explore ancient Egypt, (and mummies! ), and he has seamlessly drawn all of that scholarship into the sights, sounds, colors, and feel of his Zet mysteries. The history and description isn't ladled on or weighed down by tedious exposition but rather is introduced subtly and naturally in the context of the telling of the adventure story. As a consequence we get two kids, a brother and sister team, who are relatable and appealing and yet clearly of their time and circumstance. This is all presented in broad brushstrokes, (I wouldn't use this book as a research authority), which keeps it interesting and entertaining even while it is informative in a general and impressionistic way. The fact that there is a mystery, a theft, a conspiracy, and loads of chases just keeps the excitement and interest level high all of the way through to the satisfying conclusion. So, a very happy and rewarding find with a lot of middle grade reader appeal. A very nice book to recommend. The plot is lively and straightforward; two children who run a market stall selling pottery, witness a neighbour being accused of theft, and take it upon themselves to investigate. In the process they find out that the accusation is false, but that there is a much deeper and more sinister plot behind it. The Mystery of the Egyptian Scroll, by Scott Peters, is a children’s book set in New Kingdom Egypt, in and around the southern city of Luxor. The pharaoh of the time is deliberately unspecified. But the book is also a fantastic introduction to Egypt for children. Places, people and customs are well explained and engaging, so the book is highly educative as well as fun. Problems are solved by thought, perseverance, q the gathering of evidence, and negotiation with key people. There is no magic, and religion is dealt with as a normal part of everyday life. I would happily use this book as a way to bring something of the reality of ancient Egypt to life for a young audience. Technically the Kindle copy I downloaded had a number of problems, in particular with incorrect representation of some characters such as apostrophes. This made the book hard to read in places, especially for a younger audience. I understand that this problem is being addressed and should be fixed before long. Eleven-year-old Zet and his younger sister Kat are left with the responsibility of minding the shop while their father is in a faraway land fighting for Egypt and their Pharaoh. But each week the children’s earnings dwindle until they fear they won’t have enough to feed themselves, their baby brother and their mother. So when a thief bounds through the market place, Zet steps up to the medjay, or police officer, to offer to help catch the thief in exchange for the reward. This brave, but foolish Eleven-year-old Zet and his younger sister Kat are left with the responsibility of minding the shop while their father is in a faraway land fighting for Egypt and their Pharaoh. But each week the children’s earnings dwindle until they fear they won’t have enough to feed themselves, their baby brother and their mother. So when a thief bounds through the market place, Zet steps up to the medjay, or police officer, to offer to help catch the thief in exchange for the reward. This brave, but foolish action soon lands Zet and his sister in trouble, so deep their very lives and the lives of their family are in peril. It is an action-packed mystery set in an ancient land with great attention to detail. I recommend this historical novel to all middle grade readers. If my children were still pre-teens we would have devoured this series during our nightly bedtime reading sessions. They would have enjoyed the colorful, interesting setting and they would have worked alongside the kid characters to solve the mystery. The plot has enough hooks and turns to keep readers of all ages engaged. I appreciate the author's inobtrusive but deft writing style, which has just the right amount of detail and explanation to keep young readers on track, without boring older rea If my children were still pre-teens we would have devoured this series during our nightly bedtime reading sessions. They would have enjoyed the colorful, interesting setting and they would have worked alongside the kid characters to solve the mystery. The plot has enough hooks and turns to keep readers of all ages engaged. As an adult reader, I enjoyed this adventure story of a young boy and sister playing junior detective on the trail of a conspiracy that threatens an innocent man – and promises a handsome reward for the man(or boy) who delivers justice. The prose is easy on the eye and like tales of a certain wizard, is sophisticated enough and characters well drawn to pull in all ages. The world of ancient Egypt is well drawn and fans of Steven Saylor or PC Doherty ancient detective series will lap this one up. P As an adult reader, I enjoyed this adventure story of a young boy and sister playing junior detective on the trail of a conspiracy that threatens an innocent man – and promises a handsome reward for the man(or boy) who delivers justice. Peters like the other writers mentioned quickly takes the reader into the ancient world, padding it with enough familiar character types to make one feel at ease in this alien world. Though Peters doesn’t shy away from referring to the Sun as a God as most Egyptians would have referred to it, we are immersed and so our suspension goes undisturbed. The main character Zet is a likeable one, and one finds oneself rooting for him in this action packed yarn. Four stars for a book that appeals to both middle grade kids to adults. I didn't know how I would like this mystery. It had me laughing and scared at parts of it. I do love archeological stories and especially mysteries, so this combined two of my favorite types of reading material. One day as Zet and Kat are selling their wares in the marketplace, their daily routine is interupted as man is chased through the market with the accusations of being a thief. Zet sees his chance to improve their financial standings and uses the powers of observation that only a child would posses to solve the mystery that unfolds. This book is great for children because it offers the mental flexibilty required to imagine a new environment, and encourages self-efficacy as it features children sol One day as Zet and Kat are selling their wares in the marketplace, their daily routine is interupted as man is chased through the market with the accusations of being a thief. Zet sees his chance to improve their financial standings and uses the powers of observation that only a child would posses to solve the mystery that unfolds. I picked this book up from Amazon a number of months ago and it finally made it to the top of my TBR pile. Set in ancient Egypt this one had my interest from the start. Zet and Kat are a brother and sister combo who have a hard life, supporting their family while their father is away at war. Then, on a normal day just like any other, everything changes when Zet gets wind of a reward on offer to catch the thief of a mysterious scroll. That’s when their lives go from selling pots at their humble market stall to being caught up in a huge mystery that threatens the very safety of the Pharaoh. I admired these kids, they both showed great respect for others and exhibited some wonderful qualities. As the mystery deepens, so too does the severity of the situation. Poor Zet and Kat just seem to sink deeper and deeper into trouble as they try to clear the name of an innocent friend. By the climax of the story there’s a very real possibility that they will lose absolutely everything (which isn’t much). With opponents that seem unbeatable and tension building, Zet and Kat practically need to pull a sphinx out of a hat to put things right. Do they succeed or not? …. you’ll need to find out for yourself. It’s quite obvious from his website that Scott Peters has a great interest in Egypt. He has a lot of interesting Egyptian themed activities over there for readers who want their Egyptian adventure to go that little bit further than just reading the book. In a nutshell: This was an exciting adventure that will appeal to kids who are fans of mystery, adventure and ancient Egypt. I'm truly surprised how many people liked this book with four stars or more. I was disappointed. Although there are plenty of Egyptian references thrown about, something about it felt way too modern for me. I think it was the way the kids talked with one another, practically tossing around coloquialisms. I felt like the story was written and then the author said, "How can I make this sound Egyptian?" Perhaps I was unfairly influenced by the sub-par narration, as I also purchased the audiobook for I'm truly surprised how many people liked this book with four stars or more. I was disappointed. Although there are plenty of Egyptian references thrown about, something about it felt way too modern for me. I think it was the way the kids talked with one another, practically tossing around coloquialisms. I felt like the story was written and then the author said, "How can I make this sound Egyptian?" Wonderfully crafted piece of Historical Fiction Mystery! Readers who love Ancient Egypt will be enthralled and captivated by Peters well-researched, exciting drama. Everything from religion, fashion and lifestyle were described accurately and literally gave me the feeling that I was in Egypt during the New Kingdom era. I look forward to follow Zet and Kat on their next adventure! The series would make an interesting TV mini-series in my opinion. This was a charming story which held my attention! The children were well thought out brother and sister! I am going to acquire the set!!! I received this ebook for free from bookpub.com. I liked the adventures and descriptions in the story. I believe it is a good book and interesting. By FAR my favorite book I have read for Social Studies. Good plot, witty characters, a good book indeed! 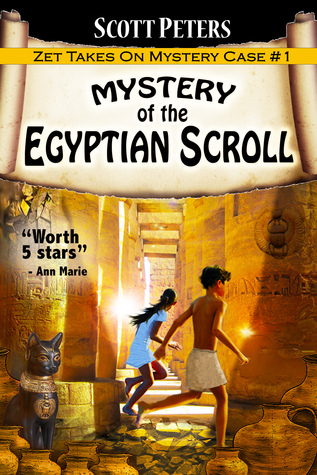 Mystery of the Egyptian Scroll is a fast paced mystery that youngsters will find entertaining and educational. 12-year-old Zet presides over of his father's pottery stall while his father is off fighting wars. A thief runs through the marketplace pursued by local law enforcement. There is a reward for anyone who can find the thief, and Zet sets out to pursue the man and the mystical scroll that was stolen. Zet's investigation leads him down many different avenues and he finds many adventures along Mystery of the Egyptian Scroll is a fast paced mystery that youngsters will find entertaining and educational. Zet's investigation leads him down many different avenues and he finds many adventures along the way. Mystery of the Egyptian Scroll is a fast paced mystery set in an ancient Egypt. Students will not only be entertained by the story but they will also learn interesting tidbits about a fascinating foreign culture. As a former Peace Corps Volunteer myself, I’m convinced that developing an appreciation of foreign cultures is always a good thing! The story unfolds with 12-year-old Zet in charge of his father's pottery stall, since his father is a soldier fighting in far away lands. Suddenly, a thief runs through the marketplace pursued by law enforcement officials. After the officials inform Zet that there will be a reward for anyone who can find the thief, he undertakes to pursue the man and the mystical scroll that was stolen. Zet boldly begins to follow the trail of clues, despite the protestations of his sister, 10-year-old Kat. Now that was a fun read. I have always loved a great adventure story - and this being based on a period of time in Egypt? How could I possibly pass that up! Brilliant book cover art, BTW. It helped to quickly grab my attention towards the book. I'll have to have my son read this when he gets older (when he learns how to read). I'll probably end up reading it to him before then. Superb story. The book is awesome with a smoothly flowing plot. Scott uses a peek-ahead overshadowing making you not wanting to set the book down until you are certain of what you are expecting next! It is one of the books with a wonderful ending! Bravo Scott!!!!! A kids' mystery that takes place in Ancient Egypt. I like the main characters enough to have read two of these so far. The mystery is fairly well developed and the historical context is reasonably well done. I loved this book. My fave subject in school is history and my fave era is ancient Rome and Egypt so this book was right up my street. I recommend it to any tweens like me who like history and mystery. Hey that rhymes!! This would be a nice series for young people. Wanted to check it out since it was for free. I enjoyed reading this book along with my students in our literature circle group. A nice mix of culture of ancient Egypt and adventure. william read it in a couple of days, just had to read the 1st few chapters outloud to get him started. Fun mystery for upper elementary/early middle schoolers.